Are you 14 to 25? Do you want to be in a band and perform live? 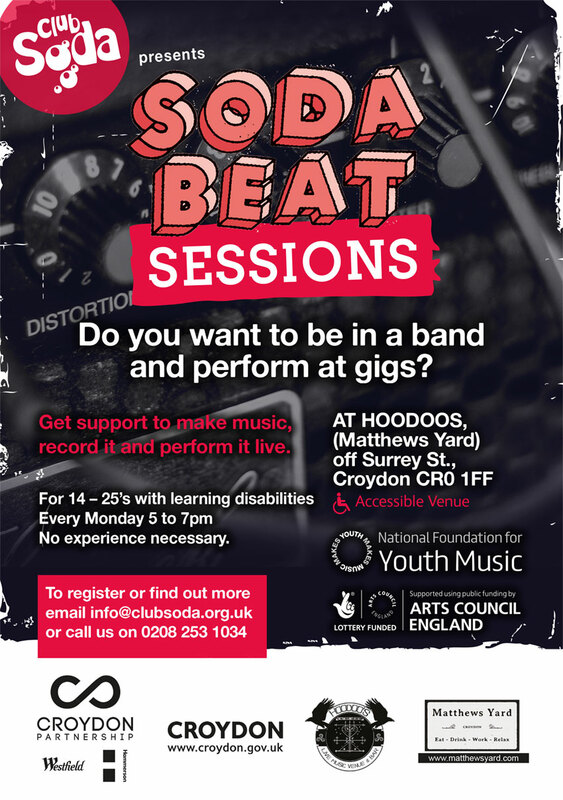 Soda Beat Sessions run every Monday at Hoodoos, Matthews Yard, between 5-7pm. They are for young people with learning disabilities aged 14 to 25 who want to play music and socialise with other music lovers. You don’t have to have any musical ability just an interest in music will do. The sessions are also for young people who already play an instrument and might be ready to form a band and perform live. In fact, anyone who joins Soda Beat Sessions will have the opportunity to perform live at one of our regular Soda Beat events. So what are you waiting for? Come and try a session. They’re free thanks to generous funding from Youth Music. Call us or email to find out more or tell us you’re coming.